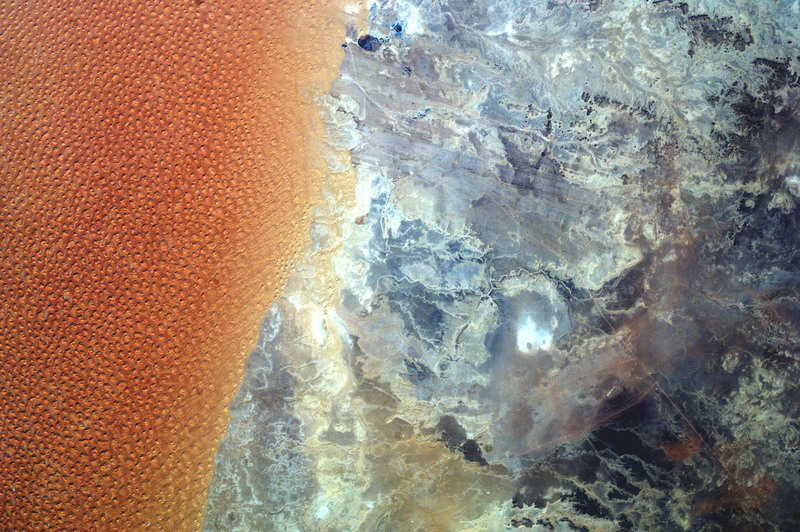 Taken through a window on the International Space Station by the EarthKAM camera, this photograph shows the boundary between a major dune field and dark hills along the border between Algeria and Libya. These landscapes are among the driest parts of the Sahara Desert. For scale, the dune margin shown in this photo is slightly more than 100 kilometers long. Large dune fields are known to geologists as “ergs,” the Arabic term for these extensive regions of sand. 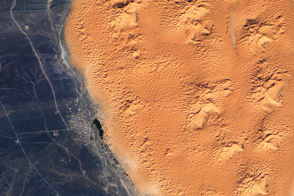 This eastern erg (known as the Oriental) of Algeria includes hundreds of dune mounds. From more detailed images we know that these are “star dunes.” The erg itself occupies a vast area of approximately 600 kilometers by 200 kilometers. Many winding water courses are visible on the right half of the photo. These typically dry channels drain occasional rain water towards the edge of the vast erg. Sediment carried by such streams has accumulated over a few million years to make the dunes. The margin in the image marks the line between a zone dominated by wind as the main landforming agent and a zone dominated by water movement. The wind-sculpted hills—sometimes called grooved terrain—have a remarkably straight pattern because they were eroded by one-directional winds from the north. A dry desert lake appears as a white surface near straight roads that cross this desert. Another lake appears as a dark patch due to the vegetation that grows in its shallow water. A dense cluster of date-palms indicates the location of the Libyan town of Ghadames, population 10,000. The old part of the town is walled and has been declared a UNESCO World Heritage site. EarthKAM photograph CCFID_152293_2017304121045 was acquired on October 31, 2017, with a Nikon D2Xs digital camera using a 50 mm lens. The photo in this article has been enhanced to improve contrast. It is provided by the Sally Ride EarthKAM@Space Camp on the International Space Station. 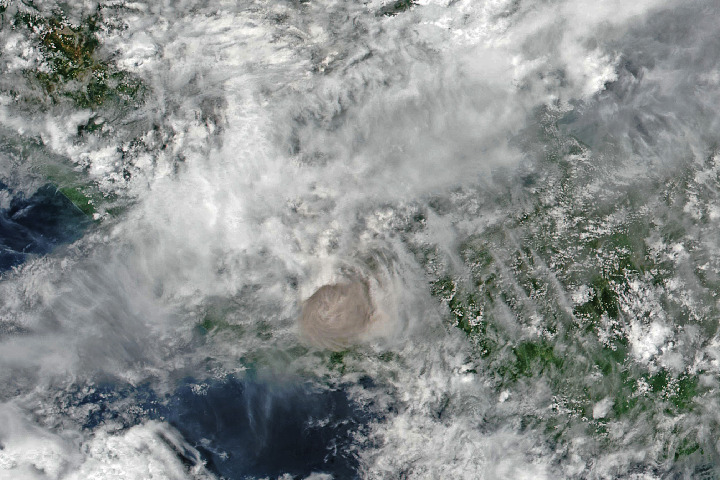 The caption is provided by the Earth Science and Remote Sensing Unit, NASA Johnson Space Center. 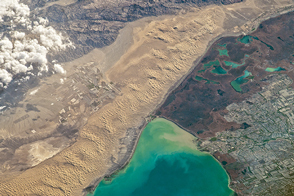 EarthKAM (Earth Knowledge Acquired by Middle school students) is a NASA educational outreach program that enables students, teachers, and the public to learn about Earth from the unique perspective of space. During Sally Ride EarthKAM missions, middle school students around the world request images of specific locations on Earth. Caption by M. Justin Wilkinson, Texas State University, Jacobs Contract at NASA-JSC. A vast field of star dunes in this desert stands astride wind-carved hills in one of the driest landscapes on Earth. NASA Earth Observatory (2016, April 4) Dunes of the Grand Erg Oriental. 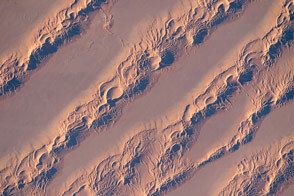 NASA Earth Observatory (2013, September 29) Star Dunes in Algeria. 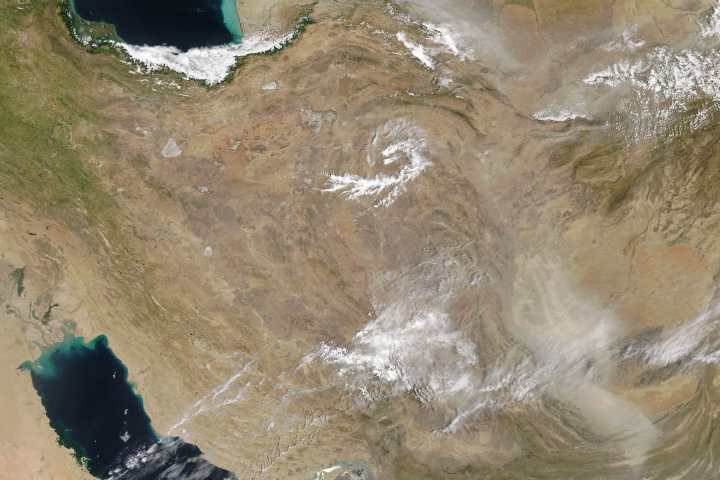 NASA Earth Observatory (2007, February 12) Erg Oriental, Algeria.